Teach the principles of sustainability. In 2005 faculty engaged in a UH Mānoa Campus Sustainability Retreat (PDF). A full day session was held at the Waioli Tea Room on September 16. The purpose of the retreat was to identify work in the various areas of sustainability currently being conducted by faculty, to acknowledge and build on faculty efforts in the past, and to collectively envision a sustainable campus and to concertedly move towards that goal in the future. 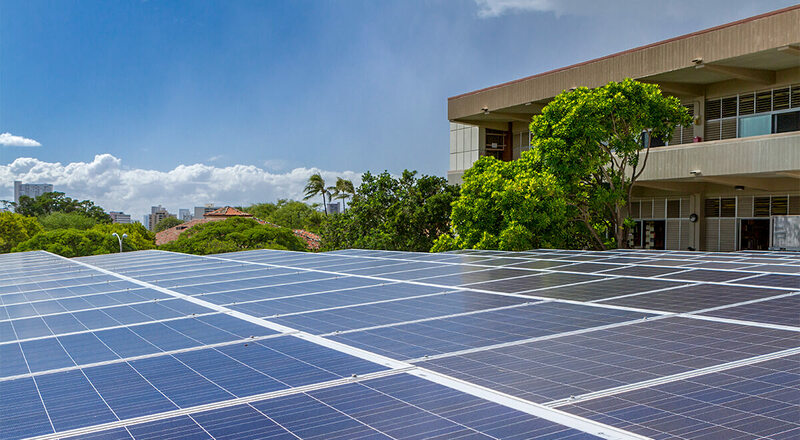 In 2006, Interim Chancellor Denise Konan announced UH Mānoa’s commitment to energy efficiency and renewable energy (PDF). In 2013 UH Mānoa implemented a new policy on sustainable food products that phases out the use of styrofoam on campus. For more information, go to the Surfrider Foundation website. Building on the 1st Annual Sustainability in Higher Education Summit, in January 2014 the Board of Regents adopted a policy on sustainability (pdf) that aims to achieve carbon neutrality, zero waste and local food self-sufficiency. It develops guidance for the University of Hawaiʻi to play a leading role in the State’s broader efforts towards sustainability, in terms of priorities for operations, education, research and community engagement. In 2015, President David Lassner adopted Executive Policy 4.202 on System Sustainability. The Policy establishes updated goals for energy efficiency and renewable energy, achieving 40% for each by the year 2035 (relative to 2008). It also adopts new building and design standards for new University construction, based on Hawaiʻi’s climate and conditions and striving toward LEED “Gold.” It also establishes curriculum goals for the development of new courses related to sustainability, as well as integrating sustainability into current courses. The Policy additionally encourages scholarship within sustainability as well as connections to community and culture.